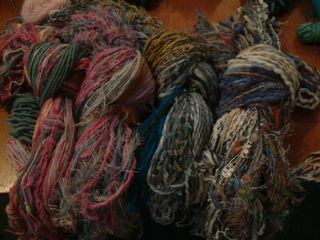 and my yarn for my rowan exchange dyed. 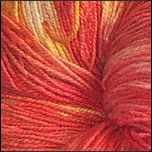 I had a bit of a disappointment with some yarn, I found Hip Knits via indie knits and got excited as they hand hand dyed cotton on sale called flame see below. Unfortunately two of us obviousley ordered it almost similtaniously so I lost out. 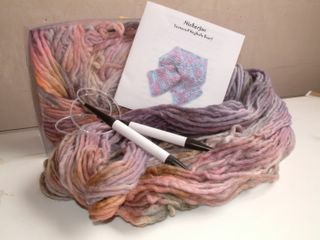 Hip Knits have been very nice about it though and have offered me free postage on my next order. And I added another Body Cheveron to me modular jacket which I am determined to finish for autumn. Check out Silkwoods Blog that I keep updated as they have just announced a competition to name one of their new bunnies and win some yarn from his first clipping. well in fact there are two of them but the other one wouldn't stay still for long enough to have her phot taken. They Russian Dwarf Hamsters according to the pet store, but as it is not the best pet store in the world I wouldn't be suprised if they turned out to be something else, I have two girls so no babies!!!! and after a short ride on Dans Moped have taken up residence in their palace of a cage in the studio (one of those Rotastak ones). They are so cute and I have been wanting a pet for a while since we lost the dog a couple of years ago especially since I started looking after Silkwood Bunnies and finally decided that a hamster would be the most practical. I saw that flame colour too and thought shall I, shan't I? Great minds think alike but it wasn't me! 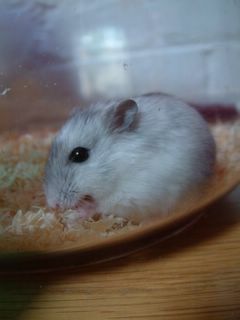 I hope your little hamsters had crash helmets on for their journey. Off to check Silkwood now.